Retrograde pyelography is used by many urologists to visualize the ureters and collecting system of the kidney. The procedure involves introducing contrast into the urinary system in a retrograde fashion with simultaneous imaging using dynamic fluoroscopy. This procedure is performed with cystoscopy by placement of an endoscopic camera via the urethra into the bladder. Normally, urine is produced in the kidney and travels down the ureter in an antegrade fashion and is then stored in the bladder. The term retrograde is used in reference to the direction the contrast is introduced. Retrograde pyelography plays an important role in the management of ureteropelvic junction obstruction (UPJO). Once UPJO has been diagnosed, retrograde pyelography is used to confirm the diagnosis and to determine the exact location and nature of the obstruction. This procedure can be done prior to or at the time of planned intervention for UPJO. Being able to accurately locate and define the obstruction is extremely important for the urologist as it will dictate what type of procedure to perform to alleviate the obstruction. Retrograde pyelography allows the physician to determine the length of ureteral stricture at the ureteropelvic junction, to determine whether a true stricture is present, and to measure the length of stricture. These criteria will further determine if an endoscopic incision can be done in the form of an endopyelotomy versus an open procedure and, in some cases, if further reconstructive options are needed if the gap of diseased ureter is substantial. Pathology within the ureter may appear as a filling defect when contrast is introduced within the ureter. 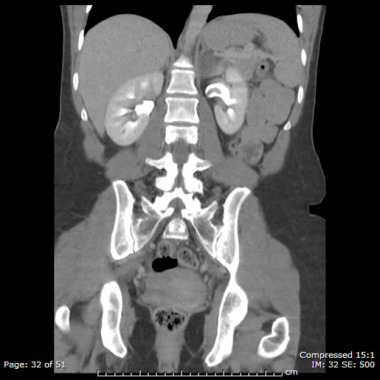 Urolithiasis is primarily diagnosed with noncontrast CT scanning. 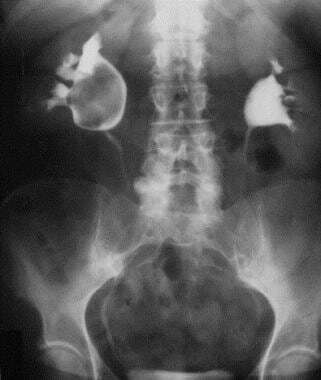 [3, 4] Retrograde pyelography is used to determine the exact location of the calculi within the collecting system. Once the location of the stone is confirmed, the stone is fragmented and can be extracted. Retrograde pyelography can also aid in the detection of any large residual stone fragment following laser lithotripsy. Masses within the ureter also present as a filling defect. However, the shape of the filling defect can differ from that of stones. A benign lesion such as a fibroepithelial polyp typically appears as a long smooth filling defect and is sometimes referred to as vermiform in appearance. Malignant tumors such as upper-tract transitional cell carcinoma can present as an irregularly shaped defect depending on the shape of the tumor. When placing a stent, it is always important to ensure that it is properly placed before ending the procedure. This holds even more importance when dealing with patients with a duplicated collecting system. In specific instances, shockwave lithotripsy is a viable option for stone fragmentation. When the stone is radiolucent and not visible on fluoroscopy (eg, uric acid stones), ultrasonography can be used with an additional option of using contrast material. 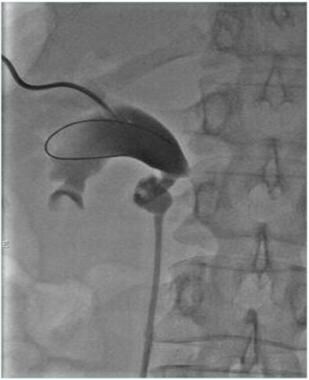 In most instances, if there is significant ureteral obstruction, intravenous contrast may not be helpful to delineate the site of ureteral obstruction. In these instances, retrograde pyelography is performed to localize the stone for shockwave lithotripsy. Retrograde pyelography has no absolute contraindications. However, the few relative contraindications are listed below. Infected urine: Caution should be taken in performing this procedure in patients with infected urine or even bacteremia. 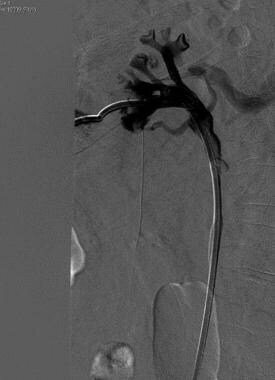 If the patient is sick and/or septic (eg, obstructing calculi with hydronephrosis), the patient should have a stent placed with gentle retrograde pyelography to ensure proper placement of the stent. In this situation, the benefits of treatment far outweigh the risk of performing the procedure. Pregnancy: In general, pregnant women should not receive more than 50 mSv of radiation, as higher levels are shown to have teratogenic effects. Most diagnostic radiographic procedures, including fluoroscopy, expose the patient to a considerably lower dose. Current investigations are ongoing to determine if there are any risks associated with low-dose irradiation. However, at this time, fluoroscopy can be performed in pregnant women. The physician should determine with the patient if the benefit of the procedure outweighs the risks. The physician should ensure that the patient has not already been exposed to numerous bouts of radiation prior to this procedure to ensure the safety of the growing fetus. Allergy to contrast: Typically patients with a known allergy to contrast material do fine during this procedure, as the contrast is typically not absorbed into the bloodstream in any significant amount; thus an anaphylactic reaction does not occur. However, as mentioned later, if contrast is introduced under increased pressure, backflow of the contrast material may occur, exposing it to the blood stream. The physician should take extra precautions to ensure safe delivery of contrast to these patients in order to minimize this complication. Certain conditions may make it difficult to visualize or gain access to the ureteral orifice. Chronic inflammation of the bladder or bleeding may give the physician difficulty. To overcome the decreased visibility, dyes may be injected intravenously, which are excreted by the kidney to allow visualization of the ureteral orifice. Retrograde pyelography is a relatively safe procedure; however, complications are possible. One complication to be aware of is a phenomenon known as pyelovenous backflow. Backflow occurs when the contrast is injected under increased pressure and escapes the collecting system. The 2 major concerns with this complication are the introduction of bacteria into the bloodstream from urine that may be infected and the possibility for an anaphylactic reaction from the contrast. In order to prevent this complication, physicians should make all efforts to ensure introduction of contrast under low pressure. In addition, appropriate preoperative antibiotics should be administered. 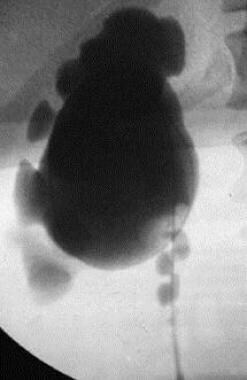 Under increased pressure, forniceal ruptures of renal calyces can also occur,  causing extravasation of contrast. This is visualized under fluoroscopy and can cause bleeding and/or infection. Normally, after decompression, forniceal ruptures will heal without intervention. Wein, Alan, Louis Kavoussi, Andrew Novick, Alan Partin, and Craig Peters. Campbell-Walsh Urology. 10. Saunders. 2011. 100-110. Print. Kim SH, Park B, Joo J, Joung JY, Seo HK, Chung J, et al. Retrograde pyelography predicts retrograde ureteral stenting failure and reduces unnecessary stenting trials in patients with advanced non-urological malignant ureteral obstruction. PLoS One. 2017. 12 (9):e0184965. [Medline]. [Full Text]. Lipkin M, Ackerman A. Imaging for urolithiasis: standards, trends, and radiation exposure. Curr Opin Urol. 2016 Jan. 26 (1):56-62. [Medline]. Dale J, Gupta RT, Marin D, Lipkin M, Preminger G. Imaging Advances in Urolithiasis. J Endourol. 2017 Jul. 31 (7):623-629. [Medline]. Singer A, Apple S. Fibroepithelial Polyp of the Ureter. Medscape. 2003. [Full Text]. Tejwani R, Wang HH, Wolf S, Wiener JS, Routh JC. Outcomes of Shock Wave Lithotripsy and Ureteroscopy for Treatment of Pediatric Urolithiasis. J Urol. 2016 Jul. 196 (1):196-201. [Medline]. Skehan SJ, Rasmussen F, Gibney RG, Lindequist S, Moller-Nielsen S, Svaland MG, et al. A comparison of a non-ionic dimer, iodixanol with a non-ionic monomer, iohexol in low dose intravenous urography. Br J Radiol. 1998 Sep. 71(849):910-7. [Medline]. El-Khoury GY, Madsen MT, Blake ME, Yankowitz J. A new pregnancy policy for a new era. AJR Am J Roentgenol. 2003 Aug. 181(2):335-40. [Medline]. Nemeth AJ, Patel SK. 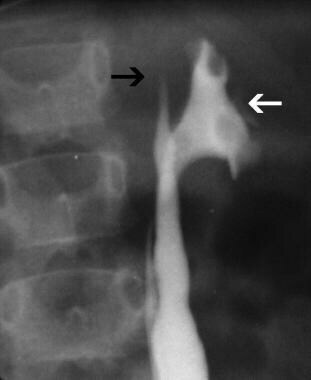 Pyelovenous Backflow Seen on CT Urography. AJR Am J Roentgenol. 2004 Feb. 182(2):532-3. [Medline]. [Guideline] Best Practice On Urologic Surgery Antimicrobial Prophylaxis. American Urological Association. 2007. [Full Text].